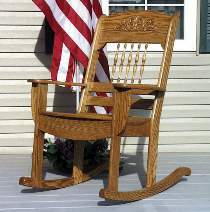 Sure to become a family heirloom - we offer a traditional porch rocker in two sizes. #W2440 is approximately 41"H x 38"L. #W2494 is approximately 33"H x 30"L. (Child's rocker not pictured.) All parts drawn full size. Order one embossed wood ornament and 5 spindles for each rocker separately below.